Open and free to all. Gifts for everyone on your list. 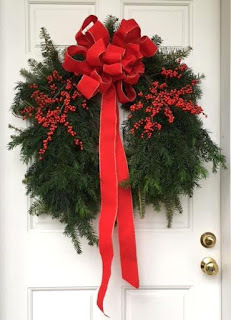 Beautifully decorated wreaths, table decorations, custom made items, that include delivery to the local area*, boxwood trees! Hand crafted items galore, jewelry, grabs for every one including pets! Gourmet foods, many packaged ready to give as gifts! A reservation for the Luncheon a must! Reserve a table for your group - please call Linette French at 978.283.2247. The Society's purpose as stated in its Preamble, was "for the performance of acts of benevolence." Through the years, the Society, and now the Circle, has contributed generously to community programs and to individuals. The Scholarship Fund, to assist young people in the Village continue their education, was established in 1974.